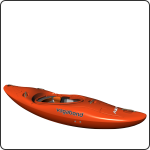 When any kayak designer works on a new design, one of the most important decisions is who to design the kayak for. This is the case with any type of kayak, but even more so with whitewater kayaks, where individual paddling styles and preferences can have a big influence on a paddler’s experience in the kayak. When I design a whitewater kayak that I intend to paddle a lot, I design the kayak for myself. This may seem selfish, but the truth is that my personal requirements are not unique. I know there are many kayakers out there who want the same things as me, and since I can’t please every single kayaker out there, it makes sense to focus on that group of kayakers whose requirements match my own. The Vubu is a kayak that I intend to paddle often, so here is what I personally wanted to achieve with this design. Chances are good that many of your requirements are the same. If you liked my previous creekboat designs, I bet that you will love this one. It’s better in every way. If you didn’t like my previous creekboat designs, give this one a try; it might just surprise you. I need a creekboat that fits with the proactive paddling style that I used to have in my younger days. Now that I am older and lazier, I’m certainly not as aggressive as I could and should be, but I still want to be able to drop an edge and shoot across the river using minimal strokes. I want to catch eddies just by engaging the hull with the turbulent water. I want to run precise lines in complex rapids, driving the boat without having to wonder whether I will stick the line. At the same time, not being as fit and sharp as my younger self, I want stability and forgiveness. I need the boat to take care of me when I mess up. I want the boat to have awesome secondary stability, because I don’t fancy falling over and rolling up constantly. At the same time, when I do capsize, I want the boat to be super easy to roll. I’m not doing much playboating anymore, which means that my rolls are not as sharp or as second nature as they used to be. I need my boat to be easy to boof, and I need it to resurface fast and move forward quickly when I mess up my boof. I also want my boat to be fast for the longer trips I tend to do. I want to have lots of volume to keep me in control in funny water, and I want peaked front and back decks to resurface controllably. I don’t want a hull that wanders all over the place – stable yet aimless. It needs to stay on track, unless I prompt it to change direction. At the same time, when I want to adjust my line at the last moment before dropping into the meat of a manky rapid, the boat needs to respond instantly. In addition to these boat-handling requirements, I want easy access to the stern for multi-day trips. I also want the boat to be as light as possible. I want sturdy outfitting and less parts that can break, especially when I’m deep inside a gorge with no easy way out. This led me to go back to even older roots in making low profile composite outfitting that is lighter and stiffer than anything we can produce from plastic. The result of this design journey is a creeker that I’m extremely happy with. I lost my mojo to run harder rapids a while back, but now that I have a new weapon that suits my requirements perfectly, I’m looking forward to charging hard again. About this kayak’s name: Vubu. I chose this name specifically because this is the creeker that I wished I had on my multiple trips down the Umzimvubu River and its tributaries in the Transkei. The Umzimvubu is South Africa’s third largest river. It runs through the wild Transkei region where access is limited and trips are typically a few days long in very remote conditions. I’ve had some of my best expeditions in this region, and one of the highlights of my paddling career was the first descent of the Tsitsa Gorge, which took us five days to complete. As I designed this creeker to take me safely through my next Transkei mission, it is only fitting to name this boat after the major river in the region.